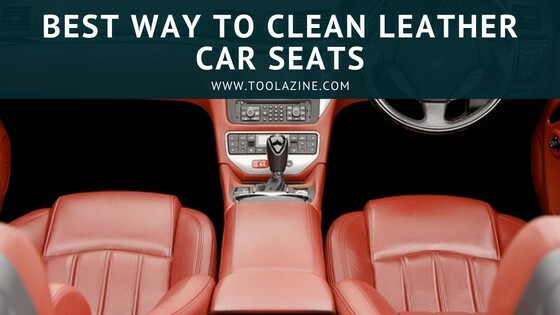 Toolazine What is the best way to clean leather car seats? If you have invested in leather car seats you will know that they add to the luxurious look and feel of a car. Leather seats are also long-lasting and can handle a lot of wear and tear if looked after properly. There are many ways in which you can clean your leather car seats and there is a wide range of leather car seat cleaners available on the market. Some cleaners are very effective others are frankly a waste of money. Leather, like most other materials, can get dirty or damaged from normal use, wear and tear. Dirt, grime, grease, as well as body sweat and oil, can get into the pores of the leather and require cleaning. Cleaning car leather seats can very time/labor intensive and in most of the cases require a certain extent of finesse. However, it is possible to do a great job yourself at home. With the right leather cleaners, you will be able to bring the leather back to life with a less effort. Once you have done that, you should keep it protected and soft. This is where a good quality leather conditioner comes in handy. The Chamberlain’s Leather Milk Conditioner and Cleaner is my choice for the best car cleaner and conditioner for leather seats. That is primarily because of its impressive cleaning results against the dirt and grime and all natural ingredients. Leather Honey Leather Cleaner is my pick for the best car cleaner and conditioner for leather seats for the money. The product is 100% non-toxic one and can be used very long time because of its strong formula (it needs to be diluted before use). Chemical Guys Leather Conditioner and Cleaner is really a quality product with which you can achieve impressive results. It is universal because it is suited for all types of leather (both cheap and fine leather). This product is very popular. Before beginning the real cleaning process you should consider vacuuming the leather seats removing the dirt and debris from the crevices. Then use the following DIY recipe to prepare a cleaning solution: Prepare a mixture of warm water and Castile soap. For the solution use the following ratio-5 parts water to 1 part soap. Using a dampened cloth with this solution, wipe dry the seat surfaces. Then with the aid of a second damp cloth wipe clean the surface of the leather. It is well-known that white vinegar works very well on leather. Olive oil, on the other hand, can be used for polishing the leather and dissolving the old oily stains. As soon as these stains are dissolved they can be cleaned afterward with the help of vinegar. As a final ingredient, you should consider adding an essential lemon oil to the mixture. Because of the fact that leather is in its essence a processed animal hide, this oil will moisturize it and give it the all needed perk. Vinegar is probably the best DIY leather cleaner, because of the fact that it does not damage the surface of the leather. The Ph of the leather is slightly acidic and varies between 4.5 and 5.0. Other traditional household leather cleaners usually have a more alkaline ph and that is why they are unsuitable for leather cleaning. Using liquid dish soap is another way of cleaning your car seats. A solution of dish soap and water is known to be very effective against a variety of old and obstinate stains. For further assistance in the cleaning process, you can use a microfiber glove. However, the major concern is leaving behind detergent residue. Put 1 cup of water into the spray bottle, then add 1 teaspoon of liquid dish soap to it. When you are done with that, place the spray nozzle back into its place and shake the bottle several times so that to make sure that the dish soap is completely dissolved in the water. Spray a fraction of the solution on the dirty places and then wipe it off with the help of a microfiber glove. Toothpaste is another common DIY cleaner. However, cleaning of your car seats with toothpaste can be very messy. The cleaning process is not complicated but also not very effective. You should just put a small quantity of toothpaste on your old toothbrush and brush the leather. Generic toothpaste can be used for cleaning stains on the surface of the leather. One of the main ingredients of the white toothpaste is abrasives. These abrasives are specially designed to wipe off the plaque from the teeth. That is why they can are used for cleaning leather surfaces also. Toothpaste can also work as a deodorizer and can deal with that old smells which have seeped through the leather of the seats. Brush the leather using a toothpaste. If there are some spots of dirt remaining on the surface go over them one more time with the toothbrush and the paste and remove them. Rub the seats dry with paper cloths. Nail polish remover is especially effective in cleaning stains from spilled food or beverage. Acetone based cleaning is only required for very dirty leather such as stains. You should try cleaning with ‘softer’ chemicals before you try this. The important thing when using this method is to make sure that it is an acetone based polish remover. If that is not the case the cleaner simply won’t work. You should have in mind that pure acetone can shrivel your skin and be hazardous to breathe so be sure to wear gloves and ventilate the area if using it. This is why using pure acetone is not advised. However, if you mix acetone with water it is safer to use but it is still advised to use gloves and operate in a ventilated area. Some people report that a mixture of lemon juice and tartar is able to remove even the most obstinate of spots and grime from the seats. It is reported that it is very effective especially against spots rich in protein such as blood spots, body, fluids, eggs, dairy products and so on. The mixture has also strong bleaching properties, so you should only use it on light-colored car seats. In the other case, it can brighten the colors of the darker upholstery and leave light spots on your leather. I do not use this for that reason. Like the nail polish remover rubbing alcohol is mainly for cleaning of spots unless the leather seats are very old and worn. You can use alcohol to deodorize and sanitize the seats after you make sure they can withstand rubbing with alcohol. Rubbing alcohol is known to be extremely effective against mold specks and can be very useful for cleaning also the interior of a cheap or not very new car. When spilling the liquids into the bottle be sure to always use a funnel to prevent any possible splatter. 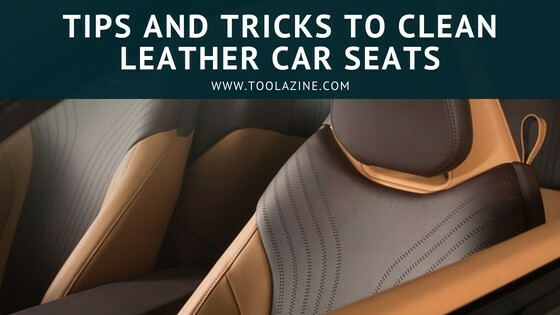 As you are able to see from the above article cleaning of the car leather seats with DIY substances is not an easy task at all. In order to be able to clean your car effectively with them, you should follow many directions and precautions. In my opinion, the far more effective option here is to use a commercial car leather seat cleaner.